This John Deere Monster Treads 6&quot; Lights and Sounds Gator and Tractor Play Set is officially licensed by John Deere. These off-road monster vehicles are ready to tackle any obstacle that lies in their path. Each one in this John Deere play set makes real-life sounds that mimic the real version. There are three functioning lights and sound action with LED lights. 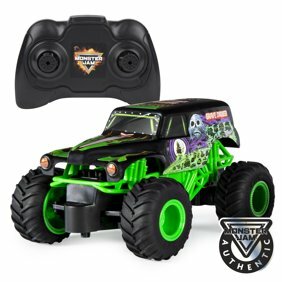 With their all-terrain steering and super bouncy tires, these toys are not only realistic, but also fun. The kids' play set also conveniently includes a set of nine batteries, which allow your kids to get straight to the action right after they open up the package. This item makes a wonderful gift for any child. This John Deere Monster Treads 6" Lights and Sounds Gator and Tractor Play Set is officially licensed by John Deere. These off-road monster vehicles are ready to tackle any obstacle that lies in their path. Each one in this John Deere play set makes real-life sounds that mimic the real version. There are three functioning lights and sound action with LED lights. With their all-terrain steering and super bouncy tires, these toys are not only realistic, but also fun. The kids' play set also conveniently includes a set of nine batteries, which allow your kids to get straight to the action right after they open up the package. This item makes a wonderful gift for any child.